Andy Robertson, No 10, is congratulated by team-mate Adam Shanks after scoring for Whitley Bay in their win over Washington. 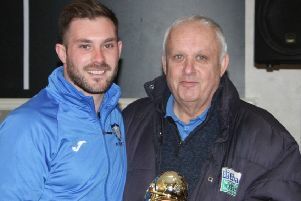 Andy Robertson, who scored twice in the victory over North Shields on Easter Monday, went one better with a hat-trick in a comprehensive victory for Whitley Bay over fifth top Washington on Tuesday evening. Following defeats at Morpeth and Norton, Whitley bounced back in style on their return to Hillheads and provided rich entertainment for the fans on a cold but fine evening. Ian Chandler’s side wasted no time in asserting themselves with Adam Shanks almost catching out Josh Carmichael with less than three minutes on the clock, the keeper just managing to get his hands on a neat cross from near the by-line. Shortly afterwards, a Bay free kick took a deflection and flew high over the bar. Whitley went ahead after ten minutes and it was Alex Kempster who was the architect, shrugging off several challenges as he burst through the middle of the Washington defence before setting Robertson clear and the young striker confidently drilled the ball past Carmichael. Two minutes later Chris Wallace fired wide for the visitors, but that was a rare break downfield. Whitley soon returned to the attack and they doubled their lead in the 16th minute. Once again the industrious Kempster was the provider, this time with a cross from the left, and as for the first goal, Robertson was on hand to slide the ball home, beating Carmichael from eight yards, much to the frustration of the Washington keeper who berated his defenders for failing to cut out the cross. It could have been 3-0 ten minutes later when Callum Patton was played clear, running through from inside his own half to beat the offside trap. He lobbed the ball over the advancing keeper but it was marginally too high and landed on the roof of the net. Washington eventually worked their way back into the game and five minutes before the interval the Bay goal had a charmed life as the ball twice struck the frame of the goal and twice Tom Flynn pushed away the rebounds from almost on the goal line. Having survived that scare, Whitley ended the half back on top with Patton forcing a save from Carmichael. Whitley continued in the ascendency after the interval. Kempster’s cross-field ball being cleverly controlled by Patton, who struck a low shot into the side-netting. For the second time in the game Whitley were saved by the frame of the goal as a long range 53rd minute strike from Adam McGuinness struck the underside of the bar with Flynn beaten, but to the keeper’s relief the ball rebounded straight across goal and into his hands. Whitley were troubling the Washington defence with balls over the top and just before the hour Patton raced onto a long ball from defence, but Carmichael was alert to the situation and got to the ball just in time and cleared it into touch. With Richard Flynn unavailable and both Stuart Bramley and Steve Gibson injured, Graham Williams had come into the side from the Reserves for only his second game, and along with Scott Prosser, he performed admirably with the prolific Washington John Butler rendered ineffective. Although they looked well in control, Whitley needed a third goal to make the game safe, and it duly arrived after 67 minutes. Robertson collecting the ball from a throw-in on the left before curling an excellent shot past Carmichael from the edge of the box to complete his first hat trick at Northern League level. Immediately after the goal, Carmichael was sent off for using foul and abusive language as he vented his anger at referee Mick McDonough for not awarding the visitors a free kick in the previous passage of play. Down to ten men, there was no way back for the visitors, and with 15 minutes left Robertson, scorer of five goals in two appearances, received rapturous applause as he left the field to be replaced by Callum Munro. The Reserves team striker, who tops the Northern Alliance scoring charts ,must now be in line for a regular first team place. Two minutes from time, Shanks was scythed down by Paul Wardle as he broke through on goal, and despite the defender’s desperate pleas of innocence, the referee had no hesitation in awarding a penalty and Shanks confidently despatched the spot kick beyond the reach of stand-in keeper McGuinness. It was an unexpectedly comfortable victory for Whitley and it took them up the table above West Allotment Celtic, who are the next visitors to Hillheads on Tuesday. Victory in that game should just about banish any lingering fears of relegation. Manager Ian Chandler was a happy man after the game and lavished praise on striker Andy Robertson. He was also delighted with the positive way his side started the game, giving Washington no time to settle and quickly establishing a two-goal lead. Whitley Bay: T Flynn, McFarlane, McDonald, Anderson, Prosser, Williams (Chambers 56), Patton, Fowler (Gladstone 83), Shanks, Robertson (Munro 75), Kempster. Whitley Bay’s Northern League Cup semi-final away to Marske United on Thursday, April 14, may have to be switched to a different venue as Marske’s Mount Pleasant ground is suffering from drainage problems and may not be playable.